The bus route loops back east toward Buckingham Palace and all the other places we had been. On the route back, we got off the bus in front of Harrod’s department store. Harrod’s is one of the largest department stores in the world. You may remember that Princess Diana was with Dodi Al Fayad when she died. Dodi was the son of Harrod’s owner. 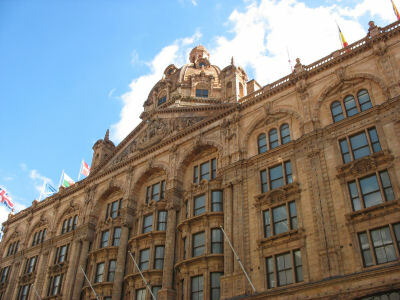 Harrod’s is elegant, packed with merchandise, and bustling with excitement. It is huge, covering 4.5 acres with over a million square feet of retail space. We soon found ourselves in one of the many food halls, where you could find just about any type of food you wanted. They have lots of food prepackaged to take home, as well as many counters where you can buy food to eat right in the store. We were hungry and Susan spotted a Krispy Kreme store. We bought four chocolate glazed doughnuts for 90 pence each. You could also purchase a dozen for £6.95. We also got a bottled Diet Coke, and the person waiting on us asked if we wanted ice. Susan jumped at the chance to have a really cold drink and was thrilled to get a full cup of ice–perhaps the first one of the entire trip. Us Americans! We do like our ice. There were about 8 seats and we grabbed two of them, scarfing down our doughnuts in record time. This was a piece of home, right in London! After eating our Krispy Kreme doughnuts, we found an elevator (ok, “lift”) and rode up to the second floor. When the door opened we found ourselves in the lavish Christmas department, where we purchased several tree ornaments. We looked around the store for a bit longer then headed back down to the street. After about 10 minutes the bus arrived, we got on board and decided to ride the bus all the way out to the east end of the line. This took us out past the British Museum, where the bus driver told us that he would be stopping here for about 20 minutes. We were going to remain on the bus and relax, but then he said that there was another bus in front of us that we could catch. So we jumped off of the bus, and ran ahead to the other bus. We decided we wanted to get on the red line and go out to sections of that line we had not seen. The blue line took us to a stop near the Hyde Park Corner tube station, where we got off the bus, walked in the entrance to the tube station, then went underneath the roadway and came up on the other side. We never actually went into the tube station. I don’t think there was a really easy way to get across the road here, so having the underground passage was very convenient. We walked a couple blocks to the designated bus pickup for the red line. Once again the map came in handy. After about 15 minutes the bus finally arrived and we got on board. The red line took us out past Madame Tussaud’s wax museum. There wasn’t much else or major importance to see. The bus route took us back through Trafalgar Square and we got off at the bus stop nearest our hotel. Back at our hotel around 5:20 p.m. we decided to rest and I wrote this journal. Next, we both started to pack and clean up the room, in preparation for leaving tomorrow. About 6:50 p.m. we decided to go back out for dinner. 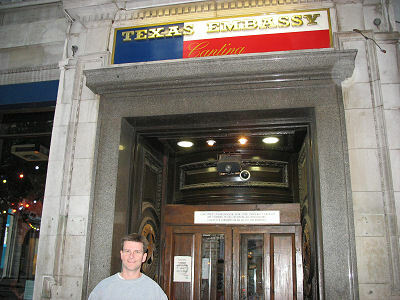 While on our bus tours, we had driven past a place called the Texas Embassy, which is a Mexican restaurant. Mexican food sounded good to us so we walked around Trafalgar Square and found the restaurant. It is located just a block off of the square. We were seated right away. The decor inside the restaurant was like a cantina. The waitress brought chips and salsa to our table. Susan noted on the menu that it said the first batch of chips were free. Unlike most Mexican restaurants in the US, here additional rounds of chips and salsa were NOT free, costing £2.50 each. However, I did note something on the menu that we had not seen the entire trip: drink refills were FREE! Dinner was very good, if not pricey. 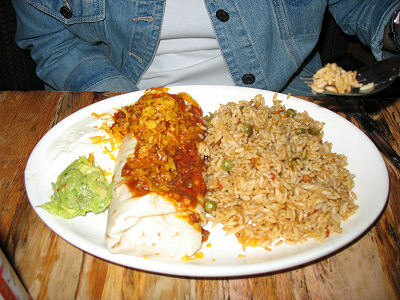 I ordered a pork enchilada, with rice and beans for £11.75 and Susan had a beef burrito with rice and extra rice, since she does not like beans, for £9.75. My Diet Coke was £2.15. Total before tip was £26.90. Service was so-so. I tend to judge the quality of service in US restaurants partially by how efficient they are at keeping my drink refilled. Here, our waitress only refilled my drink once, and that was only after I flagged her down to ask for it. So much for getting my money’s worth and thirst quenched from the refills. Before leaving, we asked if they had T-shirts we could purchase. Both Susan and I found a T-shirt we liked, and purchased those for £12 each. After leaving the restaurant, we started walking back toward the hotel and stopped in a couple of souvenir shops. I bought a T-shirt for my employee back home, then we headed back to the hotel. I went to the front desk of the hotel and requested a wake-up call for 6:30 a.m. Concerned about the baggage restrictions on flights going from the UK to the US, we asked the concierge if they knew what they were. We wanted to make sure any prohibited carry-on items were packed in our luggage. The concierge was not completely clear on the rules, but afterward we felt confident that we knew what we could and could not carry on the airplane. Back in the room around 8:30 p.m. we continued cleaning and packing. We ate the candy bars we had purchased previously and watched a BBC movie about 9/11 — perhaps not the best thing to watch when flying the next day. The movie recounted the experiences of several people in the twin towers as they tried to escape after the planes crashed into the buildings. The movie was very good, but chilling and disturbing. Once again, the movie was interrupted by the news and then it continued 30 minutes later. I turned out the light at 12 midnight but found myself unable to sleep. I got up and sat in one of the chairs, where I propped myself up with my pillow. I was hot, and the air conditioner blew directly on the chair, so it helped me to be more comfortable. About 1:30 or so, I finally fell asleep, then woke up again around 3:30. Sitting in the chair, I slept off and on until around 5 a.m., when I finally got in bed.